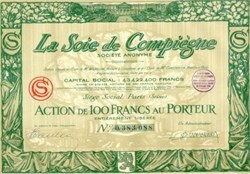 Beautifully engraved Certificate from the La Soie de Compiegne issued in 1927. This historic document has an ornate border around it with various vignettes of women draped in silk around the border, a building in the center on top and a lion coat of arms on the bottom center. This item is hand signed and is over 73 years old.